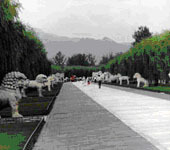 Beijing city tour, Mutianyu Great Wall, Ming Tomb,Olympic Stadiums Tour! Activities: A fantastic chance to visit the magnificent feat of engineering that is the Great Wall of China, Ming Tomb-Dingling and an outside view of the Birds Nest Stadium and Water Cube. Includes: Transportation by coach, visit and GUIDE tour to Mu Tian Yu section of the Great Wall, Ming Tomb (Dingling) and outside view of the Birds Nest Stadium and Water Cube. Lunch at a local restaurant. The Tour: You will be picked up from your hotel and will then drive to the Ming Tombs (Dingling), which are the best -preserved Chinese imperial tombs with 500 years of history. The underground Palace Halls, a labyrinth palace building, was the first royal tomb excavated in accordance with plan in China. Before lunch, on the way to the less crowded Mutianyu Great Wall, youll have a chance to visit a jade carving factory, to learn about the stone carving and undertake some shopping if you like. Mutianyu Great Wall is located to the north-east of Beijing. 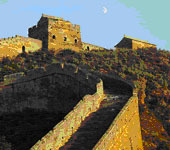 As one of the best-preserved parts of the Great Wall, Mutianyu used to serve as the northern barrier defending the capital and the imperial tombs. If you want to reach the highest point, the cable car is a good choice (payable on the spot). 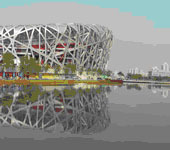 Then you will return to Beijing for an exterior visit of both the National Stadium - the "Birds Nest" and National Aquatics Center - the Water Cube. Take pictures from the outside. If you are interested in the inner structure of the stadium, the tour GUIDE will help you to buy tickets (payment on the spot). After the day tour, you will be dropped off at your hotel. Please note:Pick up time will be within 30 minutes of the time shown on your voucher, however our supplier will contact you at your hotel, the day before your tour, to confirm your actual pick up time. As from 01Jan09, the tour will arrange an outside view of the Olympic Stadium. The tour does not include entry to the inner structure of the Olympic Stadium.